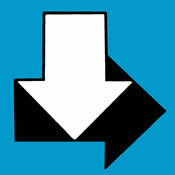 Above is the link to the CCA inside/out tournament. Although we don't always agree on the issues, I commend them for dedicating all proceeds of this tournament to Capt. Charlie Brown who is having a pretty tough time right now. The Down East Guides had the pleasure of fishing with the ladies of the International Women's Fishing Association this past week. The weather was perfect, but despite our "epic" weekend, the fishing for the big drum slowed a little. 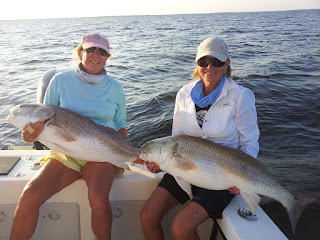 We still had a few double digit afternoons and all 12 ladies caught citation red drum, plus plenty of grey trout and blues waiting on the bite. The cooling temps and full moon are triggers for many of these big fish to head across the sound, but there are still a lot of fish in the river and there should be enough to chase for a couple more weeks, but the double digit days will be a little less common. Good news is that there is a great sign of specks and greys and the cooler temps have brought them into the creeks and shallows. Up the river, mixed with stripers, there is going to be some great fall fishing. Long half days on the bay boats are $450, full days are $600. 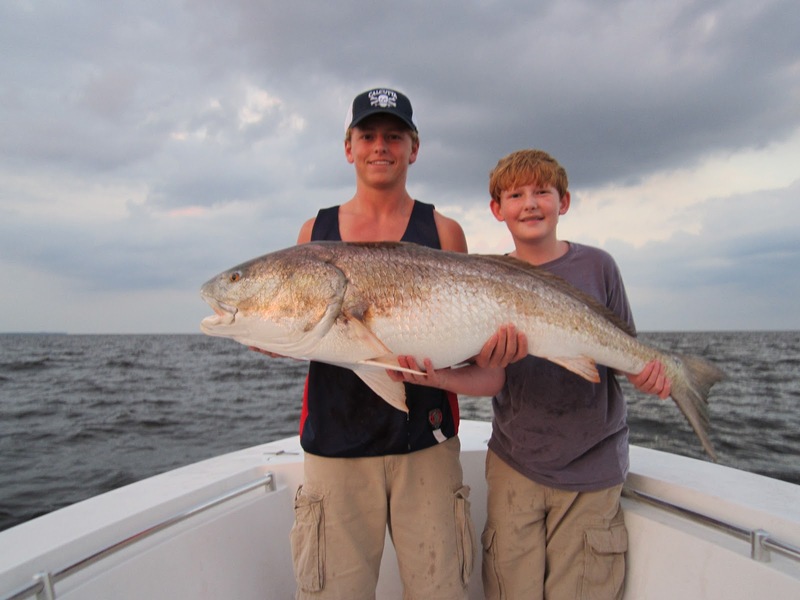 If you didn't get your citation red drum this year, there is still time, but you better get out there quick. Fall is here!!! Woop woop!!! "Gotta love it" With the wind going north and the temps cooling off the fall bite is already showing some very good signs of FIRING OFF! In the past few weeks the inshore bite on tons of nice blues, plenty of large spanish, increasing numbers of flounder, over population of little redfish (15-17" as well as some slot fish), far better signs of kingfish than the past couple years (mixed with a wahoo or two), grouper are headed back to the inshore bottom and all the other great fishing that goes down in Oct and Nov in the Morehead City area. In the past week I have had several great trips for spanish mackerel, catching/culling limits of 1-3 pound spanish as well as 1-3 pound blues. I also took one Amberjack trip which ended early because my client said "I'm good, these things have worn me out, can we fish for something smaller?" Anyone looking for a trip live bait fishing kings and jumbo spanish Oct is the time, we have some really cool bycatch on these trips sometimes....a wahoo and even sailfish are not real uncommon. 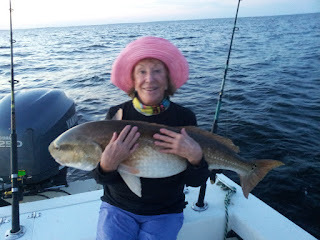 The inshore grouper bite will improve over the next few weeks too, so come get that Gag grouper before the close it down. Fall, cool air, Hot bite and smoking drags "gotta love it!!!" Just got back to England and yes we had a great time all round we got fairly lucky with every Charter. 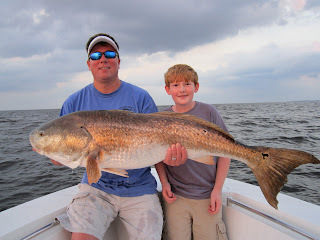 Captain Ray and his Son Chad were great we had an excellent day with some very big drum. We plan to do it again next year hopefully with more of us and will contact you then and will look at the Costa Rica info. "This is a shot from the past, Capt. George leadering my first NC tarpon"
Brett Hinson and his red red drum rod that he built. It did a great job. A pre-drum fishing mixed bag of trout, flounder, blues and croakers. Got enough for dinner, then went out for the big 'uns. All in all, we were on the water for about 3 hours. Sorry for the slack reports the last week, but I've had a special guest in town, Capt. 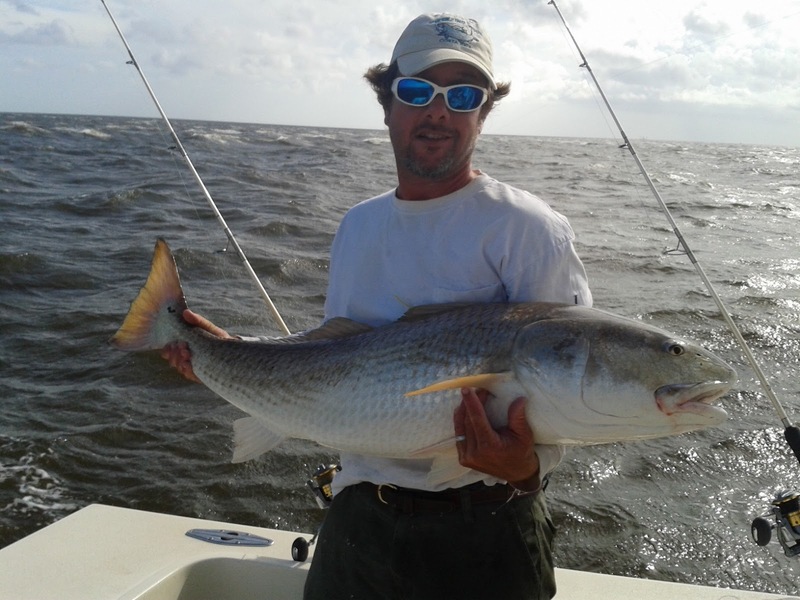 James from the Dragin Fly came up for a few days of drum fishing. We also hit that wahoo bite on the Bill Collector with Capt. Steven and Wade. After putting a half dozen wahoos in the box, we went and showed James a nice Atlantic sail. Beautiful day, just like Costa Rica, slick calm and the fish were biting. 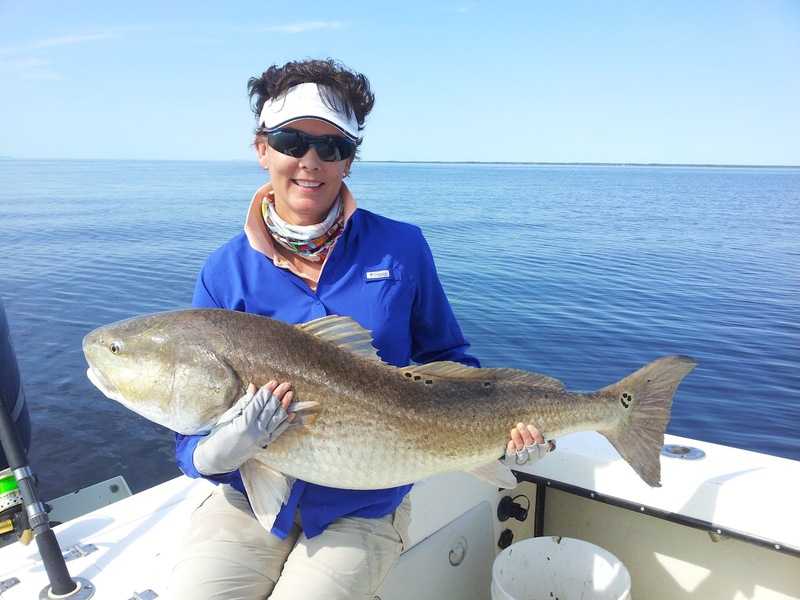 This time of year is a great time to get offshore. Give us a ring and we'll make sure that you get connected. James got into the drum fishing and helped me with a few trips, he got pretty good at chunking mullet chunks. The drum bite continues, consistent double digit days. I imagine things are going to slow a bit after this upcoming full moon, with a lot of fish that have spawned out and heading to the ocean. Surprisenly enough, there are still a lot of fish that are not done spawning and there should be good drum fishing well into October. With the light tackle stuff firing off, there are going to be some great days of fishing on the Neuse/Pamlico through the fall.....including some big drum, it's not too late. I wanted to send you the attached picture I captured late this afternoon because I think you will appreciate it a little more than most. I lost my litter mate to your Ruby a few years back and then a puppy I raised off of him about a year ago. We have filled the void of them both with the chunk of chocolate in the picture that we named "Remington". I snapped the attached picture late this afternoon with my 11 year old and our 11 month old "chew everything up" puppy with this old drum. I thought you would enjoy. Bonner, my two sons, and I took my boat out Saturday. I didn't get them the six that we caught last year, but we did get a couple whoppers. James, 12 years old, reeled him in. It's good to see folks that fish with the Down East Guides taking what they learn and applying it on their own. Just wanted to tell you what a great time we had Sat. fishing with Capt Ray. 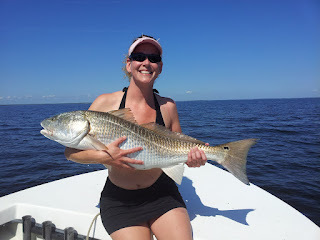 We all caught a couple of drum with our 13year old daughter catching the largest! And George, Frankie finally caught a drum!!! Attaching a pic of Kay and her drum.
" Lets see.... Giant Cloudless Sulfurs are a migratory butterfly. Whereas most butterflies lay their eggs in the fall and the adults die off, leaving the eggs to overwinter (they freeze and thaw but dont die), the Giant Cloudless Sulfur overwinters as an adult. When the days start getting shorter, they start heading south to avoid freezing to death. From as far as Quebec, they make their way due south, growing in numbers along the way. And when I say due south, I mean it. Check it out sometime... if you see a Giant Cloudless Sulfur on a beeline for your boat or house, it will not go around it, it goes up and over to stay on a straight line. They usually fly 5 -10 feet off the ground. Once it clears an obstacle, it comes right back down to its intended height off the ground without venturing off course. They make about 10-15 miles/day and it appears that the destination of choice is South-Central Florida. In years past there were huge swarms of them seen over the open ocean heading to the Bahamas, but for some reason that doesn't seem to happen anymore. Probably change in planting habits or pesticide and herbicide use. Maybe the entire genetic stock that went to the Bahamas was out over the ocean when Hurricane Andrew hit. Who knows. Anyway, the ones you see are heading to South Florida for the winter. Just like a Yankee. Then, just like Monarch butterflies, they lay their eggs and die and it's the next generation that makes the northward journey in the spring to their northern feeding and breeding grounds (in fewer numbers than the fall). And its a different generation still that comes back south. Pretty wild. Anyway, thats what I know about Giant Cloudless Sulfurs. " Thanks for a great trip with the wife and kids. You can see from the pictures the kids had a blast with the big ol smiles on there faces. The memories made on last nights trip will last a life time and we will plan for next year. They are hooked! You do a great job making it fun and educational for the kids. 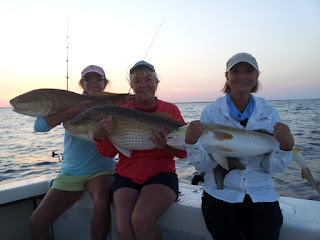 Anytime you can catch black drum, pups, giant drum (citiations) and even the skates.... it makes for a great evening and great times! Look forward to next time..
Capt. Greg turned a livewell full of shrimp into a black drum bonanza. That's Anna's favorite eating fish. Time for a little of this and the big drum on a full day.....and he's open on Thursday.....any biters? Hey George…hope you are doing well today. 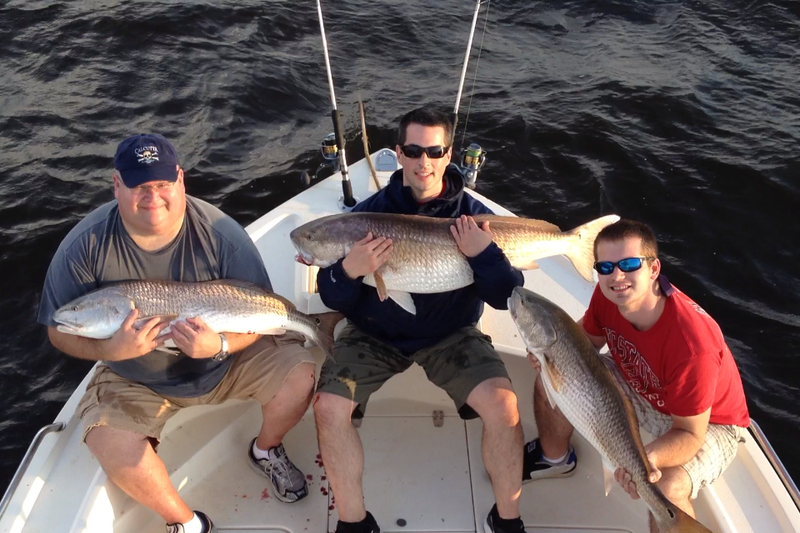 Andy, Jason, Josh and I had a BLAST fishing for the “big red drums” yesterday. Thanks again for making it a great experience for us. We always enjoy fishing with you. I’m attaching a few of the pictures from the trip.